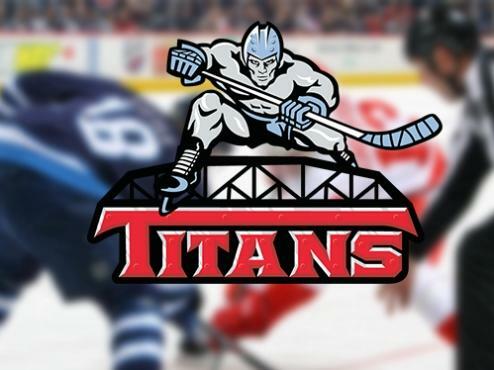 Mac Wiseman scored the overtime-winning goal in the New Jersey Titans’ 2-1 victory over the Jamestown Rebels at Middletown Sports Complex on Saturday night. Kyle Jeffers finished the night with a goal and an assist while goaltender Ryan Winter made 31 saves in his Titans debut. With New Jersey’s win over the Rebels, they improve to 15-10-0 while taking a one-point lead over Jamestown for 2nd place in the East Division. New Jersey started strong in the opening minutes of the opening frame, but Jamestown made a push with numerous offensive chances later in the period. Winter made a few big saves on a handful of odd-man rushes and breakaways, making a strong first impression with his new team. “Those kind of saves always gives you a big boost in confidence and helps make the game go a lot smoother. You get those stops under your belt early and you feel like you can stop everything,” Winter said. Kyle Jeffers opened the scoring at 7:13 of the first period with a power-play goal. He received a pass from Zach Nazzarett at the bottom of the left faceoff circle, made a quick pivot towards the net and flicked a shot over the glove of Rebels goaltender Noah West. It was his team-leading 15th goal of the season. The Rebels evened the score at 8:13 of the third period when Alex Frye slammed a one-timer in the low slot off a feed from Jimmy Glynn. The shot beat Winter glove side as Frye picked up his 13th goal of the season. It remained tied at the end of regulation, sending the contest into overtime. Both teams had a few chances at the start of the three-on-three session, as Winter and West traded a handful of good saves. As the overtime approached the three-minute mark, Wiseman broke up a pass in his own end while Jeffers started a two-on-one the other way. Jeffers laid a pass across to Wiseman, as he roofed a backhander over West for the game-winning goal. After the game, Doremus also spoke about Winter’s debut with the team, making 31 saves just days after being acquired from the Amarillo Bulls. Both teams have a quick turnaround as they play the second end of a back-to-back today at 3:10 p.m. at Middletown Sports Complex. Fans in attendance can partake in a free holiday raffle, and the game will be streamed on hockeytv.com.